Welcome to the Emergency Measures Radio Group - Ottawa ARES web site. This page provides general information about our group, our clients and our partners. The information will be useful for anyone interested in Emergency Measures Radio Group (EMRG), EMRG services, or anyone interested in becoming involved with EMRG as a volunteer. 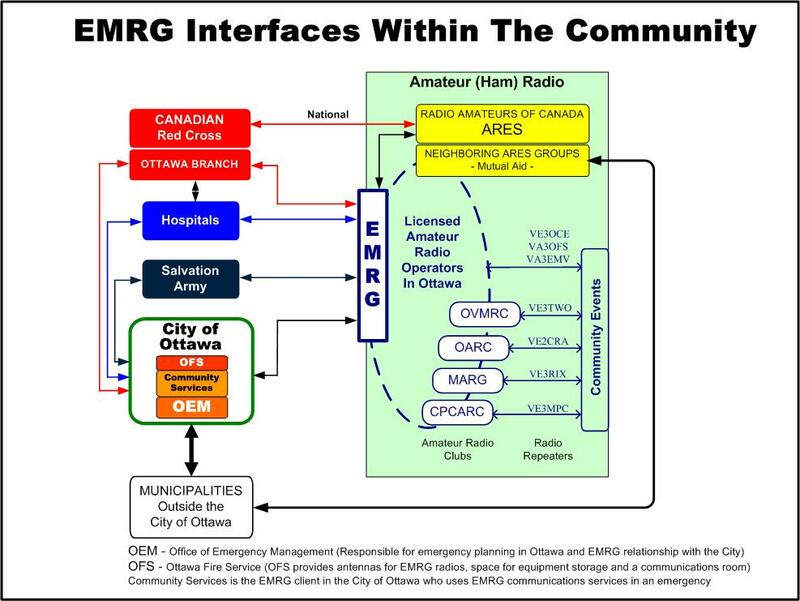 As part of the humanitarian response, EMRG radio communications would be used to link shelters, mobile care teams and community patrols, with key sites such as the City of Ottawa Emergency Operations Centre (EOC), the Community Services Command Centre, the Ottawa Red Cross Headquarters and the Salvation Army. In a sustained emergency EMRG would not be able to provide sufficient resources to operate 24 hours a day for an extended period of time. Depending on the emergency, local Amateurs may be part of the population impacted, reducing the number of EMRG volunteers available to deploy. 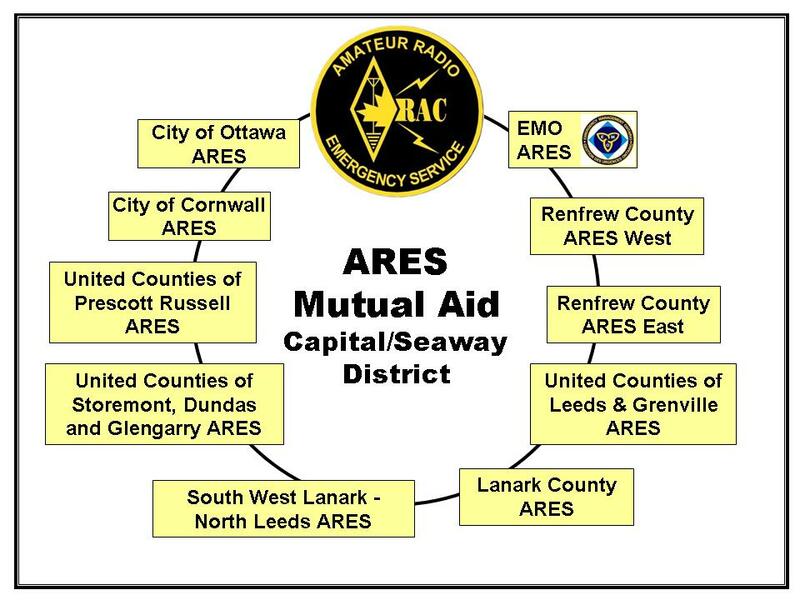 In the event that additional resources are required, EMRG has a Mutual Aid agreement with neighbouring ARES (Amateur Radio Emergency Service) groups and meets on a yearly basis to improve mutual aid process and standards. Additional Amateurs can also be brought in from further away if required. Relationships with the agencies and organizations that use volunteer communications. In an emergency, people use what they know and trust. Relationships take time, but demonstrate commitment and allow an opportunity to demonstrate skills and build trust. Training to understand how to communicate effectively under emergency conditions. Net control for an emergency is much different than the local weekly nets. Not all Amateurs know everything about radio operation. Organization and structure so key leadership roles are in place and understood by Amateurs radio operators and the client organizations being served. Someone must be in charge, so Amateurs know who to follow and clients know who has control. Personal Preparedness to ensure that the right personal and radio equipment is available and can be packed quickly. Clothing for several days is important, as is the ability to operate from multiple power sources, or to operate from locations without any communications infrastructure. Communications Preparedness to ensure that the infrastructure in the area will be able to support emergency communications. If some areas have no repeater coverage and the other areas have repeaters without backup power, the communications effectiveness will be low. Practice is key to anything from sports to volunteer radio communications. Practice sharpens skills, points our areas to work on and identifies problems to solve in order to make the groups capabilities stronger. Planning is required to ensure that the group forms into a team, that the communications requirements are understood and that solutions are in place to meet those requirements. The EMRG approach to Amateur radio as an Emergency Communications resource is based on a current and realistic view of what is required and what Amateur radio can provide. EMRG works to educate the Amateur radio population to the requirements for Amateur radio when providing emergency communications, through presentations at local Amateur radio clubs, the EMRG website and displays at local hamfests. Communications for local events such as walk-a-thons, ski races, soccer tournaments, etc, is often provided by the local amateurs, typically through one of the amateur radio clubs. EMRG is typically not involved in these events directly because most clubs have a history of working with specific events and the clubs draw from the same pool of local amateurs to provide the communications. Many EMRG members participate in these events, which is encouraged by EMRG because it is an excellent learning opportunity. In 2007, EMRG provided communications for the Tour Nortel. This is an important addition for EMRG, because public service communications provides an excellent training opportunity for amateur radio operators to perfect operational skills and develop equipment improvements. The role of volunteer radio communications in Ottawa began back in the 1950s and early 60s. EMO (Emergency Management Organizations) were set up at the national, provincial and municipal levels. Equipment was put in place for emergency use, to link agencies within a municipality and to link municipalities. In 1963 the XM49 Emergency Radio Squadron (XM49ers) was enlisted by the local EMO coordinator for the Regional Municipality of Ottawa-Carleton, as a way to expand the base of radio operators in the event of an emergency. EMO provided courses in First Aid and CPR as well as training exercises. In 1966 the XM49ers assisted during the Heron Road bridge collapse. The XM49ers were using General Radio Service (GRS) communications, often referred to as CB. In 1980, amateur radio VHF repeaters were available in Ottawa and a group was formed called the Emergency Measures Amateur Radio Group (EMARG). This expanded the base of radio operators in the Region and provided communications using repeaters. In 1990, the present organization, the Emergency Measures Radio Group (EMRG) was formed. Today, all EMRG members have an Amateur radio license. In 1999, Radio Amateurs of Canada (RAC), the National Amateur Radio organization, appointed the EMRG Team Leader as the ARES EC for Ottawa. ARES (Amateur Radio Emergency Service) is a Nationally recognized organization under which many Amateur radio emergency communications groups are organized. Appointing the EMRG Team Leader as the Emergency Coordinator (EC) for ARES in the City of Ottawa brought the ARES name and organization into the National Capital. Being part of ARES broadened the recognition of EMRG as the local volunteer Amateur radio emergency communications group, while not changing the role or responsibilities for EMRG. The control of EMRG remains with the EMRG Team Leader, however the group now has two names, EMRG and Ottawa ARES. One major advantage of Amateur radio is the many frequencies available for use. These frequencies are assigned in bands of frequencies rather than as individual channels. These frequency bands have different advantages such as local communications using VHF and UHF or long distance using HF. EMRGs local communications is based on VHF and UHF radios, similar to those used by commercial services such as taxis or Fire Departments. When establishing an emergency communications network, EMRG can establish multiple local communication networks, each with their own frequency. These local networks can be linked together through a wide area communications network on still another band or frequency. Additional information on EMRG technical solutions and projects can be found in the Technical section. Please contact us and join us at our next General Meeting.